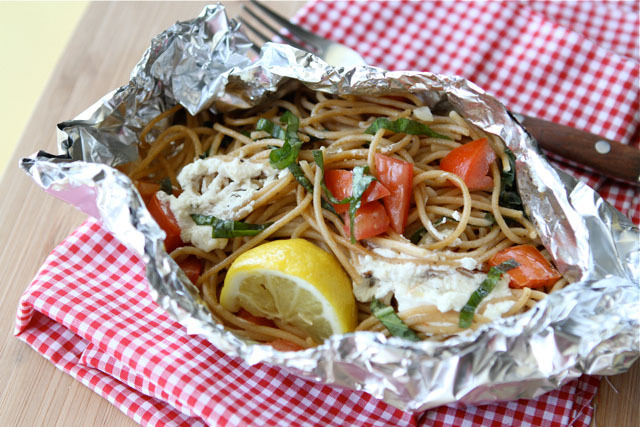 Foil pack cooking for camping has been around for ages and lots of campers love the easy recipes that go along with this style of cooking – maybe you are one of them? Another popular name for this style of cooking is hobo meals. 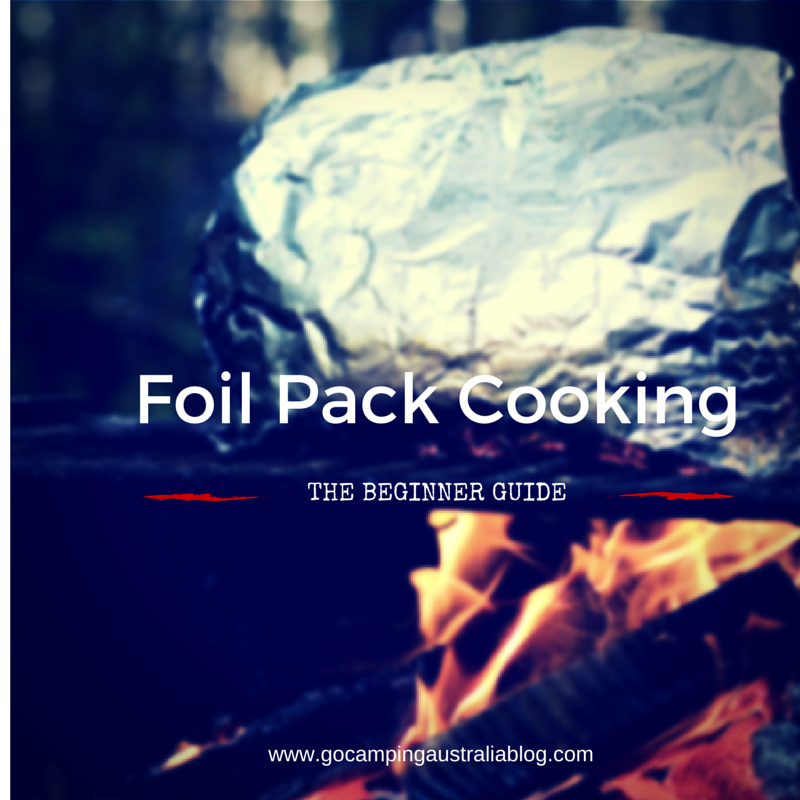 But if you are new to foil pack cooking when camping (and this method can be used at home, so don’t just wait for a camping trip), then you need to read on, and find out more about why this method of cooking could be on your next camping trip meal plan. Here is the beginner guide to foil pack meals when camping! What is foil pack cooking? 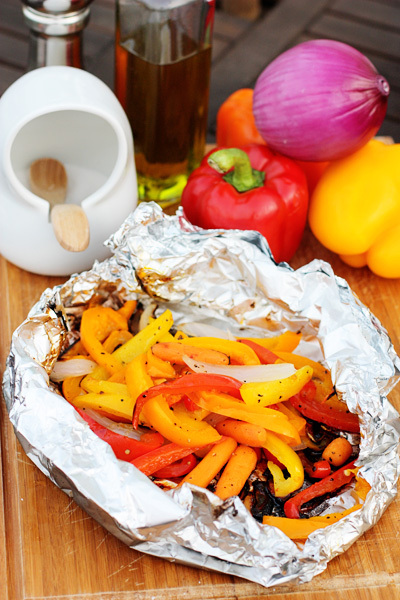 Cooking a meal in aluminum foil is a quick and easy way to have meals, with most of the ingredients placed in foil, and then placed in a campfire or on a grill to cook. It’s back to basic cooking, with hardly any cleaning up afterwards. So that is one big highlight of this cooking method, because no one enjoys cleaning up. 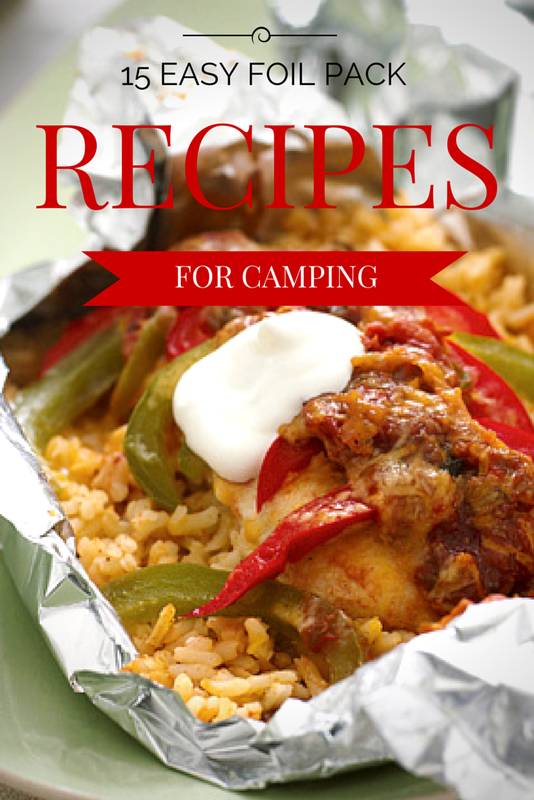 Another plus to this cooking for you is that you can make them ahead of time (even before you leave home in some recipes), which means you can enjoy your camping time more, and not have to do a lot of prep work at the campsite. The concept is to put all the ingredients you need for your meal in the foil packet – either all together from the very start of the cooking time, or different ingredients wrapped separately to allow for different cooking times. As the food cooks in the foil pack, all the juices combine together and when you open up your foil pack, your meal is ready to eat! Try to buy heavy duty foil (available in supermarkets, and it will say it is heavy duty/catering foil). But if you don’t have it handy, then everyday foil will suffice, but you may have to double/triple it over. 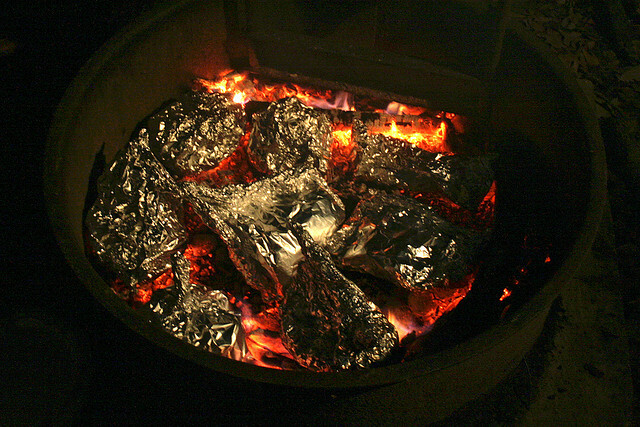 You don’t want to see your meal in the coals as you were frugal with the foil. Better to have too much foil than not enough. How to make a foil packet? There are 2 sorts of foil packets. One that allows food to be steamed (so a tent foil packet), and the everyday flat pack foil pack (suitable for meats). 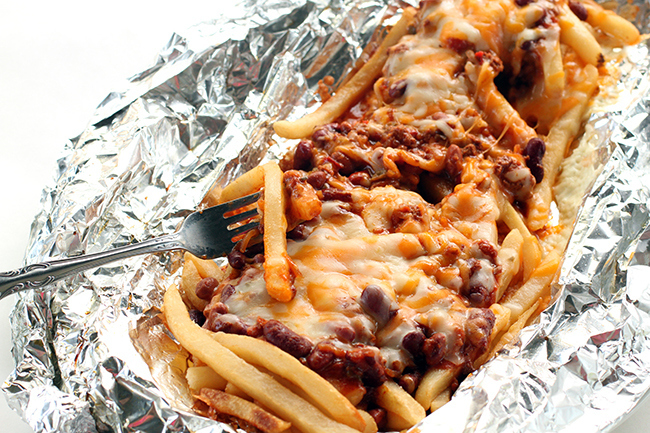 The sort of food you are cooking determines the foil packet you make. 1. 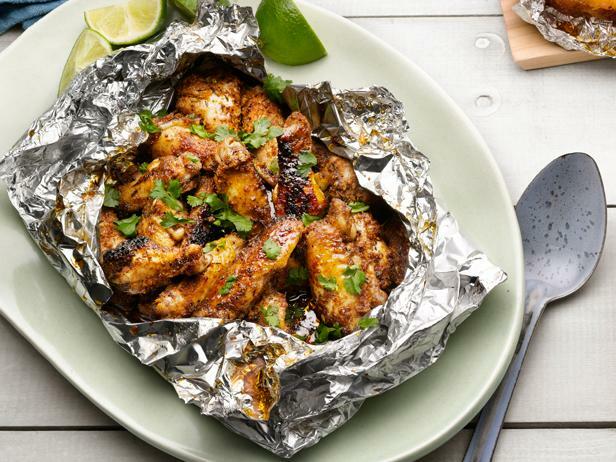 Get your foil ready (and spray with non stick spray to avoid problems later on). 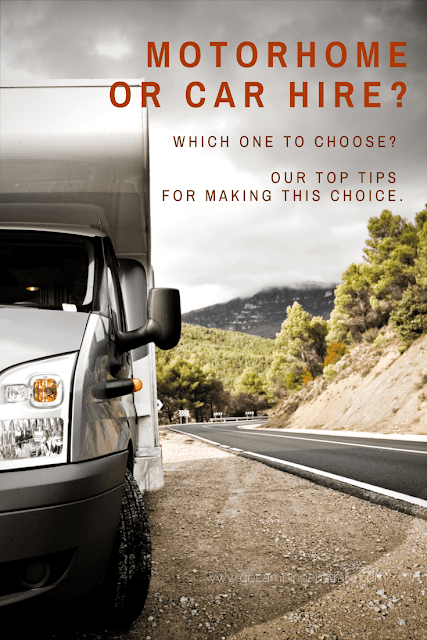 Don’t skimp on the length of the foil – better for it to be a bit too long than too short. 2. 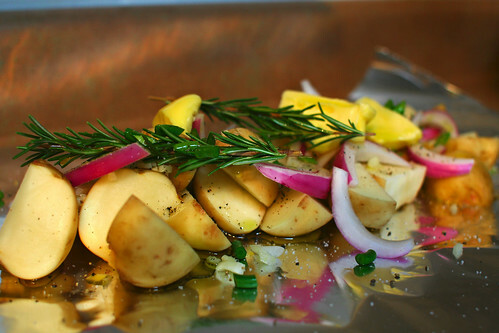 Place your ingredients in the middle of the foil sheet. 3. 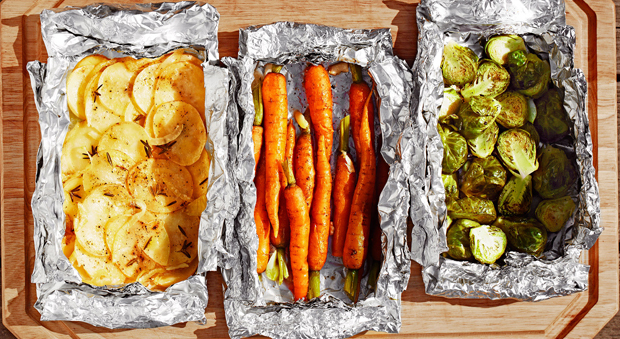 Fold up the long sides of the foil at the top of the food and crease them over. 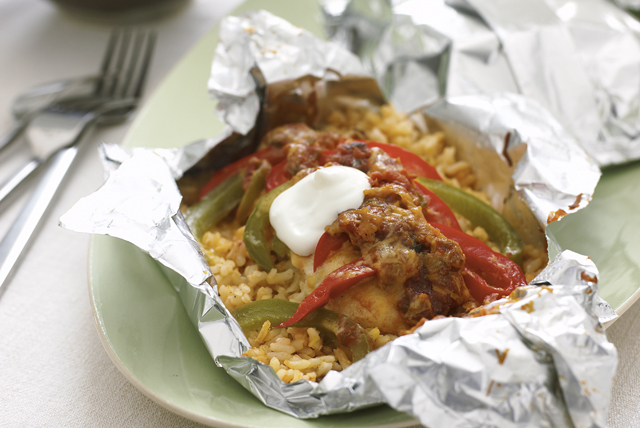 Then fold over the foil again and again, until it is up close to the food inside. 4. Now start on the ends by folding them over and over again, tightly, until you reach the food inside. 3. Pull up the long sides of the foil so they meet at the top, but aren’t sealed – so they are standing upright. Note: If you are using liquid in the foil pack, you may want to place it inside another foil pack, just as a precaution. The recipes that call for liquid really need that liquid and you don’t want it draining out, and then opening the cooked packet to find a dry crusty meal. 4. The short sides need to be folded over numerous times, towards the food, so we have a open foil bowl looking structure, that will hold any liquid you need to add. 5. Fold down the long sides by creasing them together and folding down until the packet is sealed. 3. 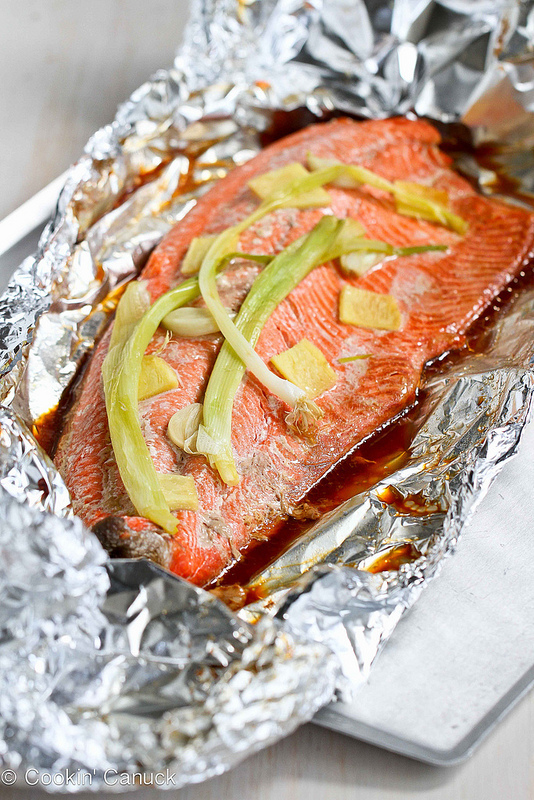 Fold up the long sides of the foil at the top of the food and crease them over. 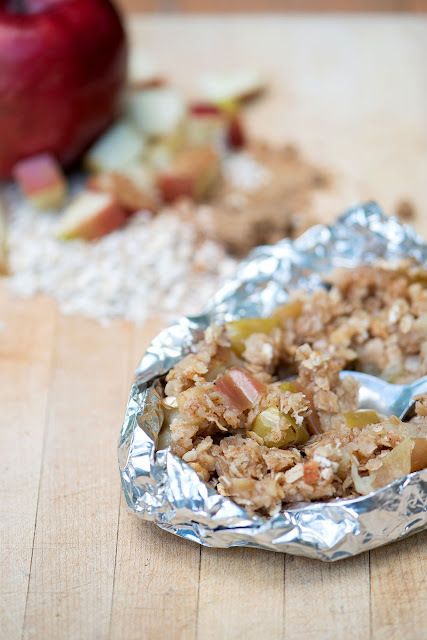 Then fold over the foil again and again, but stop a few turns before you get to the ingredients. You need to leave space between the foil and the ingredients. This infographic gives you a bit more of an idea on how it all works. Where do I place the foil packs? - on a grate over the campfire (allows the food to cook more evenly, as air will be circulating underneath) Or on a hotplate. 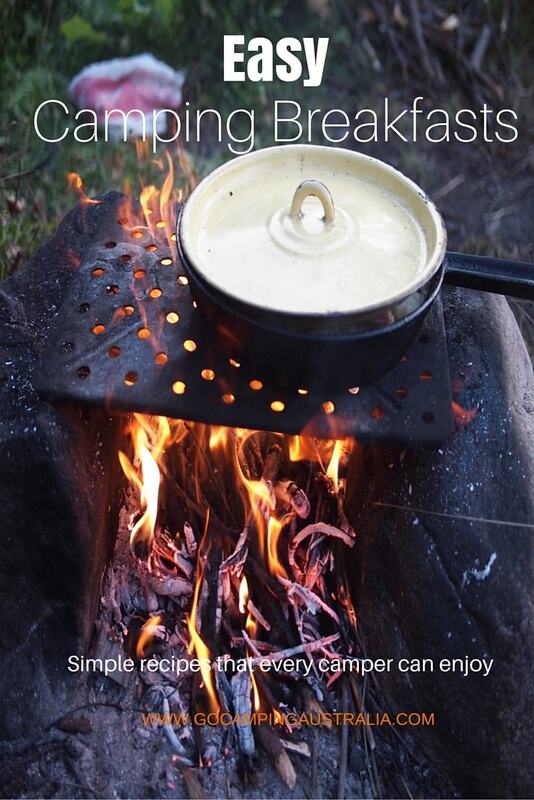 1) Cooking on a campfire is a bit trial and error, no matter your cooking method/style, so like all other cooking methods, keep an eye on the foil packs, and be prepared to move them around to suit the temperatures and ensure food cooks evenly. 2) May have said it 5 times already in this story thus far, but here is again; better to have too much foil than not enough. 3) Open up the foil packs carefully – a lot of steam may be generated, so take care. 4) Food safety is always important, and make sure meat is cooked properly before eating. 6) Vegetables can take a long time to cook, depending on the vegetable. If using them, cut them up in small, even, sizes to get the cooking done as quickly as possible. 7) Meat can go dry (and therefore very untasty) without some sort of liquid in the pack. Now you know how to make them, what to cook? There are loads and loads of recipes out there, so for you, a beginner, we have put together some nice easy ones to start off. I have avoided the ones where food has to be cooked in all separate packs and then combined at the end, because it might be getting a bit more work, and therefore detracting from the simplicity of it all. 2. Add 1-2 hash browns, chopped. 6. Place over the coals for 15 minutes or until the bacon is cooked. This won’t win awards for healthiness. It involves frozen chips /French Fries (any variety), can of chilli (you could try Old El Paso Chilli Con Carne) or you can add your homemade meat topping (or you could go without any meat topping at this point), and add about 1 cup of cheese. Bake over coals/grill/BBQ or oven for about 15-20 minutes. 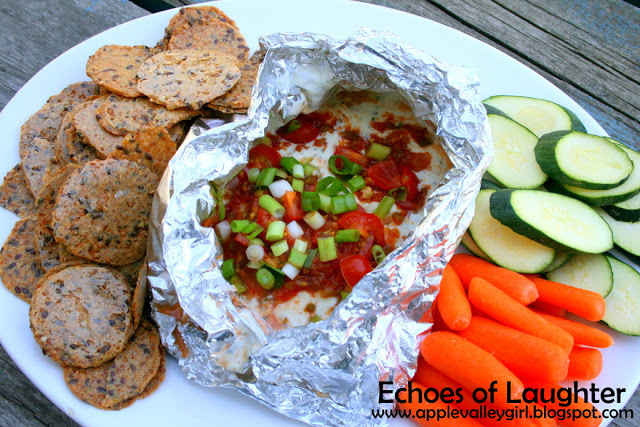 Open up the foil and eat right out of the packet! 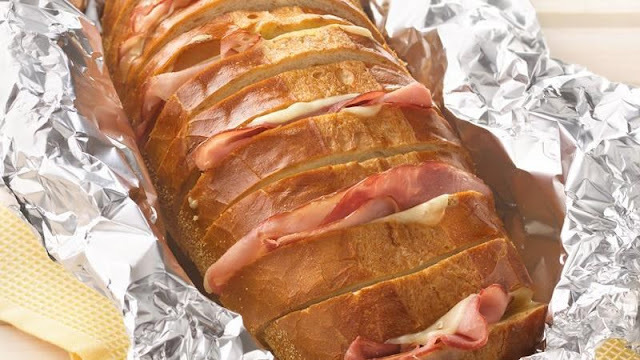 Feed the family with a crusty loaf, ham and cheese and of course your foil: you will have easy, pull apart ham & cheese sandwiches by the end. This is a really simple option for a lunch, or very easy dinner? Chicken can be a bit bland if not seasoned, so go heavy on the Taco Seasoning and Salsa to give it a kick. And pound out the chicken breast so its similar height/size, to allow even cooking time. 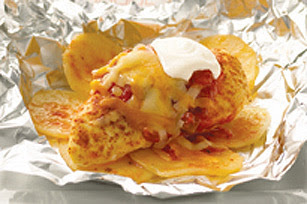 Each foil pack needs – 1 chicken breast, sprinkled with Taco Seasoning and Salsa, topped with shredded cheese of choice. Cook for 30 mins over the coals until chicken is done, and serve with sour cream. You can read more information about the recipe via Kraft Canada. If you have left over spaghetti (and you might always cook more than you need because its not easy to judge is it? ), then here is a way to use it. 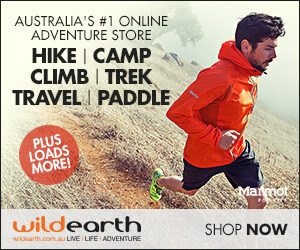 Make these packs up before you leave home, and your dinner is sorted out first night at camp! You can read about the quantities of tomato, goats cheese and seasoning at the delicious website, Tasty Kitchen. I would marinate the night before you make to help the flavour develop, though this recipe doesn't make mention of it. This recipe has you making your own dressing, but if you don’t have time, check out the sauces aisle at your supermarket – you might find something similar there. To read about this recipe, head to the website Cookin' Canuck. 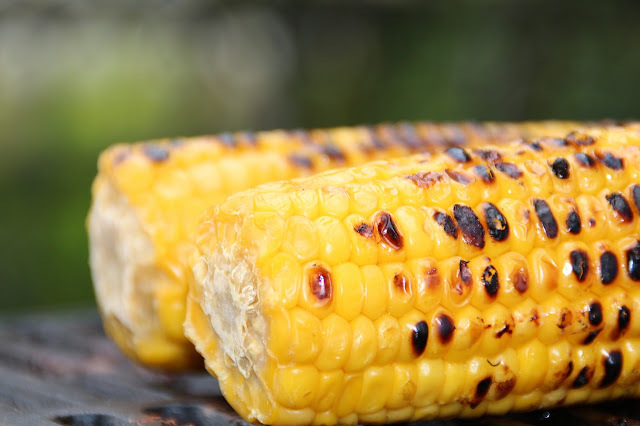 The classic vegetable to wrap in foil is corn on the cob. Get some soft butter, and add herbs to the butter - you might have with you - parsley, thyme, rosemary, basil (chances are you won’t have the fresh herbs with you, so use the dried ones), and then in the foil, put the corn on the coals or grill for about 25mins. Lots of butter on the corn is a good idea! BSintheKitchen.com gives us this easy apple crisp recipe for foil. Because dessert is a must. Variation on the apple crisp above, but with peaches and using granola! 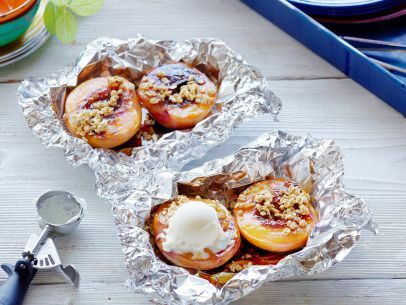 Of course, peaches aren't mandatory - use any of the stone fruit when in season. The recipe is via FoodNetwork.com. When it’s not quite dinner time, but you are having drinks around the campfire and thinking about dinner, it’s nice to have something to nibble or gorge yourself on. From website Echoes of Laughter, comes this recipe. This blogger is one food blogger who definitely appeals to my tastebuds! It needs Philadelphia Cream Cheese (they come in different flavours now, so choose a savoury one if available), salsa, onion (or maybe some sweet chilli sauce). You can serve with simple biscuits or vegetables if you are feeling healthy! 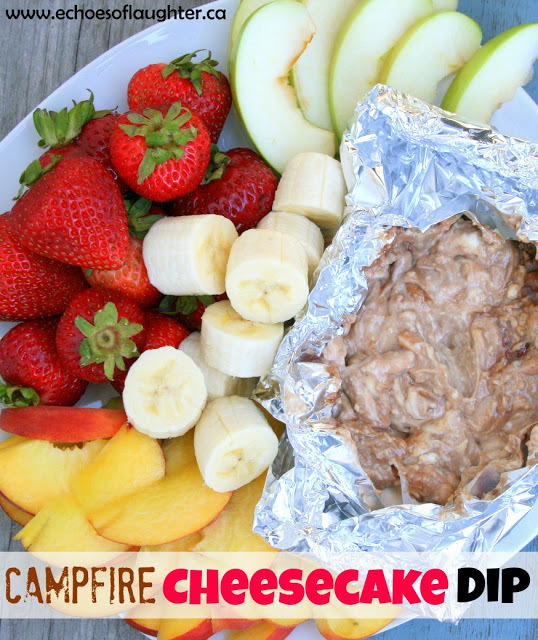 From the same scrumptious website just mentioned above, try this cheesecake dip, with Philadelphia Cream Cheese again and chocolate, all in a foil pack. Wickedly good and it's served with fruit so it's practically a health food. Might not look the prettiest when melted, but the taste is all that matters! Then check out this Girl Scout of LA PDF – yes, its American, but the recipes will give you some idea on what you can do with foil packs. If you liked this guide on foil pack cooking and the recipes, please share the story far and wide via social media buttons at the end.